A group of G.I. 's on a last furlough in Asia before coming home, bride their way into attending a secret religious ceremony where they hope to witness a human being transforming into a snake. Their intrusion is discovered and they are cursed to die one by one, no matter where they go. The curse starts acting on them almost immediately, but as their numbers dwindle, the final survivors discover that the new girlfriend of one of them is really a snake-woman bent on destroying them all. 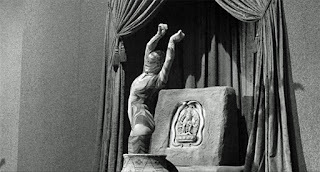 Cult of the Cobra (1955) is one of Universal's more unusual horror movies. 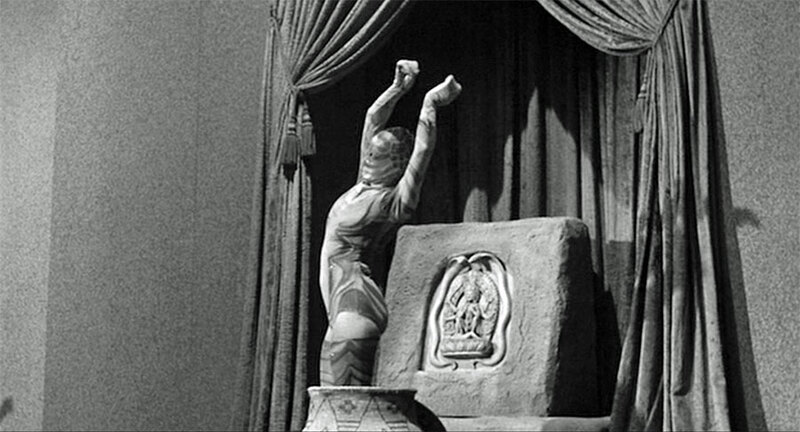 There is no iconic monster, and it feels more like fantasy exotica, like The Mole People, than something like The Mummy. The movie's plot is pretty straightforward, but succeeds by working with the camaraderie between the cursed men, as well as romantic successes and rivalries. The film also wisely relies less on the obviously marionette acted cobra, and instead uses an eerie pov effect from the snake's vision to represent it. Faith Domergue's unusual beauty lends her character a convincing otherness lending credibility to her ability to turn into a cobra.